My sermon from the Second Sunday of Advent (December 9, 2018) on Luke 3:1-6. Listen to the recording at the bottom of the page or read my manuscript below. I’d like to start my sermon today by inviting you to forget something we just did. We heard a tiny bit of Jesus’ story from the gospel according to Luke which is one of the four gospels that contain the theological insights that serve as a foundation for our faith. Every Sunday morning, I introduce our reading from the gospels by inviting you to stand if you are able and then I say something like, “The gospel according to Luke, the Third Chapter.” This introduction prepares us for what comes next. We know we’re going to hear Luke’s version of Jesus’ story and since we’re in the third chapter, we’re already moving through the story God wanted to tell. In fact, we know exactly where we are in God’s story, including chapter and verse, because, at Christ Lutheran Church, everything is printed in our bulletin. But what if it wasn’t? What if there was no introduction to this text at all? I imagine it might sound different. So let’s try it. Let’s forget everything we just heard, including where this text appears in God’s story, and let’s listen to the first two verses as if we’ve never really heard them before: In the fifteenth year of the reign of Emperor Tiberius, when Pontius Pilate was governor of Judea, and Herod was ruler of Galilee, and his brother Philip ruler of the region of Ituraea and Trachonitis, and Lysanias ruler of Abilene, during the high priesthood of Annas and Caiaphas, the word of God came to John son of Zechariah in the wilderness. If we didn’t know better, those two verses sounded like the beginning of an epic story. We met an Emperor, a governor, two rulers, two high priests, God, and some guy named John who was hanging out in the wilderness. The text begins at a specific time, in the fifteenth year of some Roman emperor’s rule, and it’s okay if you don’t have the years of the reigns of all the Roman Emperors memorized. What matters is that these verses are focused on a specific time and on a specific place where everything is defined by who was in control. The Emperor Tiberius was on top. He’s the one who appointed the governor and he allowed Herod and Philip and Lysanias to rule as kings subordinate to him. Even the religious authorities were under the Emperor’s control because no high priest could assume their office unless Roman power let it be so. So we received seven names, showing us the complete picture of who had power when this part of Jesus’ story took place. And that’s when the word of God, God’s voice, God’s energy, God’s point of view, and God’s power, came to a guy named John who was hanging out in the wilderness. Now, the wilderness John was in was overseen by one of the rulers the Roman emperor put in place. But being a ruler of a place and actually ruling it are two different things. In the Bible, a wilderness was always a strange, mysterious, and untamed place. 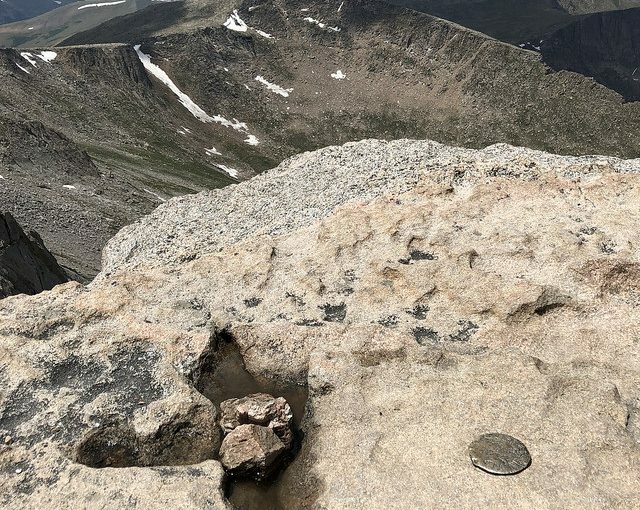 We might imagine John wandering into ancient Israel’s version of the Alaskan frontier, a place where wild animals ruled and where the necessities for human life were hard to come by. A wilderness, especially in the Bible, was a place of desolation and scarcity. But a wilderness was also, at the same time, an experience of God’s provision and protection. During the story of the Exodus, the ancient Israelites complained constantly about spending 40 years in a place without enough food and water. But that wilderness was also where God provided them manna and its desolation shielded them from being re-enslaved by their former Egyptian rulers. Later, the young David who eventually became king and the prophet Elijah both fled into the wilderness for safety and, while there, they were sustained and protected by God. The wilderness, according to Scripture, is more than just a desert or an untamed mountain range. The wilderness is also an experience where our normal sense of who’s in charge and who’s in control is undone. Our wildernesses are those moments, places, and even years where the control we assumed we had over our lives is turned around. John wasn’t only hanging out in a desolate and untamed place. He was also living into an experience where he had limited control. The structure of order and power proclaimed by the first seven names that started this passage wasn’t where John was living. Instead, John was in the middle of his wilderness, in the middle of nowhere; a nowhere that fully embodied the isolation, the fear, and the anxiety we all experience when we are in our “nowheres” too. Yet it’s in that “nowhere” where the word of God comes. It’s in those untamed and uncontrolled moments when God shows up. The word of God skipped over the seven names of those who had control and instead went to an eighth name living in the wilderness. We sometimes act as if John, the son of Zechariah, appeared in the wilderness suddenly, only when the word of God showed up. But John wasn’t only passing through the wilderness when God’s word came. Instead, he had been in the wilderness for a very long time. The fifteen years of the reign of Tiberius was also a signal to us that John’s life in the wilderness lasted longer. 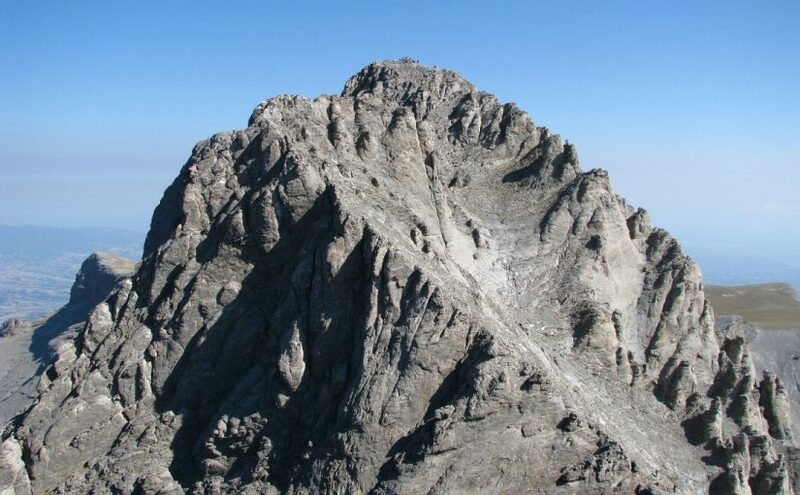 John’s faith, personal growth, and spiritual strength developed in that place where scarcity, isolation, desolation, fear, and lack of control was all he knew. God formed John to be the one who could prepare the way for Jesus, not in spite of his wilderness experiences but because of them. John knew that, when we’re living in the wilderness, it’s only by trusting God that we can be carried through. Our wildernesses might not fully match up with John’s. There’s a good chance we won’t find ourselves near the Jordan River, deep in a deserted desert. Our wildernesses, instead, might be located in a doctor’s office, a school, at work, or even in our homes. Our wilderness might, instead, be something we carry with us as we live our life with grief, or sadness, or a lack of knowing who, exactly, we’re supposed to be. The wildernesses we live in might last a day, a week, a year, or even a lifetime. Yet our personal wilderness does not mean that we are far from God. Our wilderness cannot separate us from the One who skipped over those who thought they were in control and instead visited John who knew how little control he actually had. God doesn’t wait for us to have our lives together before God shows up. God makes a commitment to each of us that there is no wilderness we find ourselves in that God won’t go into too. The structures we put into place to try and figure out where we are in God’s story will always miss seeing the ways God provides, nourishes, and sustains. And when we believe that our wilderness is hiding us from God, trust that God is already there with you, and that you will find your way through. How can we thank God enough for you in return for all the joy that we feel before our God because of you? Night and day we pray most earnestly that we may see you face to face and restore whatever is lacking in your faith. My sermon from the First Sunday of Advent (December 2, 2018) on 1 Thessalonians 3:9-13. Listen to the recording at the bottom of the page or read my manuscript below. When was the last time you received someone’s generosity? I’d like you to think about that because, in a few moments, I’m going to ask you to share that experience with the person sitting next to you. Now I know this question can, at first, be a bit vague because we usually don’t talk about those moments in our lives when we receive generosity. Instead, we like to focus on being generous, on how we give. Generosity, as a concept, “has to do with the way we use our skills …[to] share ideas, practice hospitality, offer encouragement, make connections, and use our time [and resources] to address the needs of others.” (Living Generously, Stewardship Resource) Generosity is seeing someone else’s vulnerability and, for a moment, helping that person become a little more “complete” than they were before. It feels good to fill the need we see in the people around us. And it’s also easier to talk about the ways we’re generous because we then don’t have to let others know about those times in our lives when we were vulnerable too. Showing others our generosity sometimes invites us to bury those moments when we needed help and care. Yet generosity is how we love and it’s also, I think, how we experience love from one another. Generosity is an action, a practice, and a virtue that forms us, molds us, and helps us build the relationships we need so that we can become the people God wants us to be. And that kind of generosity takes many forms. It could be financial, like when a friend takes us out to dinner knowing we can’t pay them back. Or generosity could be when a loved one lets us vent, knowing they can’t solve our problems but they can create a space where all the feelings, emotions, and words inside us are finally let out into the open. A friend we haven’t spoken to in awhile might give us a call or a stranger might notice how tired we are and give us their seat on the bus; these are all examples of generosity and we receive this kind of generosity everyday. Yet we struggle to acknowledge it. But as we see in our reading from Paul’s first letter to the Thessalonians, naming our vulnerability and celebrating generosity is part of what being a Christian is all about. Paul’s first letter to the community in Thessaloniki is, most likely, the earliest piece of Christian writing we have. Paul wrote to a small group, of maybe a dozen or so, early Christians who had responded to Paul’s preaching and teaching in their city. Paul wanted to spend a significant amount of time in Thessaloniki, to support the small Christian community and help their relationship with Jesus grow. But something happened and Paul had to flee. The community in Thessaloniki was left on their own with no formally trained spiritual leader to guide them. And this worried Paul because Thessaloniki wasn’t your regular ancient Mediterranean town. It was the capital of a Roman province, with a large garrison of Roman soldiers keeping watch. Thessaloniki was a city full of Roman monuments and buildings promoting the authority of the Roman emperor who was starting to call himself “the Son of God.” Temples to other gods filled the city and each one had a large and devout following. And since Thessaloniki was a city in northern Greece, on a clear day, every person in that city could see in the distance, Mount Olympus, the tallest mountain in all of Greece and the legendary home of Zeus and other gods. Paul had to leave behind a small community of Christians in a city where Roman power, Roman rule, and Roman religious life had all the outward benefits and prestige. Paul worried that this community wouldn’t survive in the face of all that Rome. Yet it did. And not only that, they thrived. Their faith grew. They continued to worship. And they, as a community, learned how to live together – persevering through hardships and celebrating each other’s joys. God, through a divine and generous love, protected them and Paul’s joy literally leaps off the page. He can’t thank God enough for them, for this community in the shadow of Mount Olympus, that God didn’t abandon. Paul, I believe, honestly wanted to return to them, to be with them, but he knew that it wasn’t him who kept them together. Rather, it was God’s generosity in the face of their vulnerability that carried them through. The Christian community in Thessaloniki, on the surface, wasn’t very strong. The community was young, it’s spiritual leader had fled, and Christianity was so new that the New Testament hadn’t even been written yet – so there was no collection of writings to help shape and guide them. They were a community surrounded by other faiths and points of view that were bigger, more powerful, and were more richly rewarded. The Thessalonians in Paul’s community were completely vulnerable – and yet, they thrived. In the face of overwhelming outside pressure, the Thessalonians and Paul admitted to themselves and each other that it was only God’s generosity that kept them following Jesus. And this true God, this only God, was, while they were vulnerable, truly with them – giving them a faith that would carry them through. Receiving generosity is hard because we then have to admit our own vulnerabilities. Yet we all have stories where the generosity of others is what carried us through. That kind of generosity, while mediated through human hands, comes from God. And it’s God’s generosity that sent Jesus into our world to experience everything we do, including what it’s like to be vulnerable. It’s God’s love that shows us how we can be generous. And it’s Jesus’s generosity that reminds us how we all need love. I invite you now to take a few moments, a couple of minutes, and share with the person next to you a short description of a moment when you received someone else’s generosity. My sermon from Christ the King Sunday (November 25, 2018) on John 18:33-38a. Listen to the recording at the bottom of the page or read my manuscript below. Now, if you were meeting Jesus face-to-face for the first time, what would your question be? It could be anything yet I’m pretty sure none of us would ask Pilate’s question. Pontius Pilate, as we remember, was a Roman governor who ruled Jerusalem and the surrounding communities during Jesus’ years of public ministry. Pilate was appointed by the Emperor and he embodied Roman authority, control, and military might. He was the Emperor’s representative when the Emperor wasn’t around. And when Pilate spoke, everyone in Syria, Judea, and the Middle East listened. Pilate’s governor mansion wasn’t based in Jerusalem. However, when the Jewish festival of Passover took place, Pilate moved into the city with a large cohort of soldiers. They were there to provide security, crowd control, and to keep everyone in line. Gigantic religious events had a tendency to encourage riots, conflict, and revolts. So Pilate was ready to eliminate any threat, no matter how small it seemed. Jesus had also recently arrived in the city. 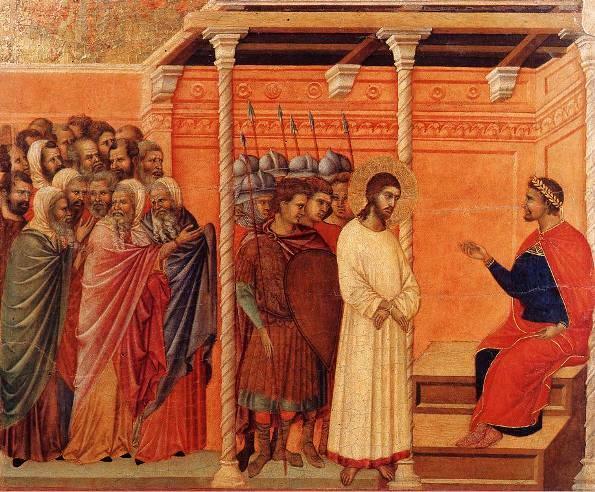 After teaching in the Temple and sharing a final meal with his friends, he was betrayed by Judas and arrested. After being convicted in a trial overseen by the religious authorities, Jesus was handed over to Roman power. Pilate didn’t care if Jesus was a spiritual leader. And he wasn’t looking for any religious advice. Pilate wanted to know if Jesus was a threat. And since the religious leaders had handed Jesus over to him, Pilate already assumed he was. Pilate’s first question, out of the gate, was a political one. He wanted to know if Jesus claimed any kind of authority that would challenge Rome’s rule. Pilate could only imagine the world as he knew it to be. And any king in his world needed certain things. A king needed territory, followers, and resources. A king needed an army willing to kill on his behalf. A king, in Pilate’s mind, needed to inspire fear, conflict, and co-operation in those they ruled. And if Jesus could do any of that, then he would be a king and he would challenge Rome’s monopoly on that power. We tend to imagine the outcome of politics as having some kind of material shape. Politics involves people having power and that power is expressed by having authority over others. Politics is made real in a specific location – be it in a city council chamber, in a part of Congress, or even in the unspoken table seating charts dictated in some high school lunchrooms. Politics, we believe, is about controlling domains and forming our own, personal, kingdoms. Yet Jesus’ politics was, and is, different. He came to live out his commitment to a world that was already overseen by him. As part of the Holy Trinity and as the One through whom the entire universe was made, there’s no domain or kingdom or territory that doesn’t already belong to Him. When it comes to God’s creation, there’s no territory that Jesus needs to fight for to control. So Jesus chose to build personal, meaningful, and deep relationships with us since we already live in God’s world. And in the words of Rev. Karoline Lewis, “… Jesus’ Kingdom can be anywhere, anytime that Kingdom behavior is exemplified…lived out…and That Kingdom witness [is] heard and observed.” What Pilate couldn’t see was that Jesus’ kingdom was rooted not in things but in people. Jesus wanted people to connect with God’s ultimate promise to them – that we are loved not because we are perfect but because God is – and that promise…changes everything. It changes how we interact with each other. It changes how we live with our neighbors. It changes how we make, preserve, and modify the general rules under which we live. Rather than being focused on “winning” whatever conflict we’re in, our faith in Jesus compels us to realize that we – on a cosmic and divine level – have already won. So instead of competing with one another, we can choose to love each nother. Instead of seeking out victories over those we disagree with, we can chose to help them thrive. Instead of building walls to give us a fake sense of security, we can work on building bonds of friendship – knowing that those bonds take much more work to create but are the only way to develop lasting peace. We get to be honest about the ways we’ve failed to use our power for good and we get to stand up to racism, sexism, classism, and every-ism that stops us from seeing the image of God in the people around us. And because of our baptism, we get to imagine how our politics can be a way we serve God and our neighbors. Jesus as the truth means that, sometimes the truth we tell, is anything but. Yet when we cling to Jesus, listening to his voice over all others, we find ourselves testify to his truth of forgiveness, mercy, service, and, above all, love. 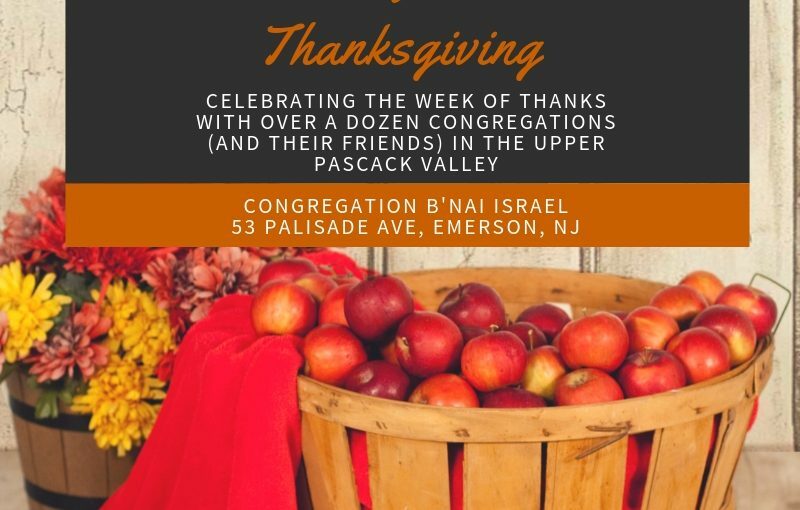 Pastor Marc’s sermon for the 50th Annual Interfaith Thanksgiving Service (Upper Pascack Valley Clergy Council) hosted by Congregation B’nai Israel on November 18, 2018. Listen to the recording at the bottom of the page or read my manuscript below. So I’m not sure how it happened but I, somehow, went through all of my formal education without really digging into the rules of English grammar. I never diagramed a sentence. I never memorized what a split infinitive was. And, to the chagrin of those who edit my newsletter articles, I love the Oxford comma. At first, I was fine with this lack of formal grammar education because, as a kid, I planned to grow up and become a paleontologist, or a computer programmer, or an engineer. I figured I could learn what I needed to know through a version of paper-and-pencil based osmosis, absorbing whatever it is I needed to know. But the Lord had other ideas. And I’m now in a career where using words is what I mostly do. Every day, there’s an important conversation about faith and life that becomes a vehicle through which we love our neighbor as ourselves. And there always another sermon to write, article to compose, and newsletter to create. These words end up being more than just a tool for communication. They are how we love, serve, forgive, welcome, and embody the faith that makes each of us exactly who we are supposed to be. For those of us who are able to write and speak, our words become containers of the sacred. And this sacred speech does something. Our words are how we build relationships with each other. Our speech is how we create opportunities for reconciliation and forgiveness. Our words can make someone’s day and, when misused, can cause unbelievable harm. I sort of wish I paid more attention in English class. But there’s at least one grammar rule that I, somehow, can still articulate. And that rule says we’re never to end a sentence with a preposition. Now, a preposition is a word like with, by, for, in, or, to, and it’s used to express a relationship between a noun or a pronoun and some other element in a sentence. For example, in Deuteronomy 8, verse 3, it says: “God humbled you by letting you hunger, then by feeding you with manna…” That “with” is a preposition. I was taught to avoid ending any sentence with one of those kinds of words. But as I prepared for tonight’s message, I discovered that this so-called “rule” wasn’t really meant for English speakers. The grammarians who decided this took a rule for latin and dictated that English speakers should do the same thing. It’s a bit ironic that I ended up memorizing the one grammar rule that wasn’t really a rule to begin with. But it helped me stay connected to prepositions. And these kinds of our words, which contain the sacred, are especially important when we’re talking about thankfulness and gratitude. When we center our gratitude in gifts rather than in indebtness, the prepositions of thankfulness show us that when gifts are given, “connection comes alive.” (97) In the words of Diana Butler Bass, “when it comes to gratitude, ‘me’ always leads to ‘we’.” (97). When we are grateful for something, grateful to someone, and grateful with others – our gratitude creates community with all those things on the other side of the prepositions. And that community is grounded in every gift that the Eternal One has first given us. Now, in my Lutheran Christian tradition, everything begins with gifts. Our life is a gift. Our relationship to God is a gift. Jesus, we believe, is a gift. And even our faith, our ability to say who we are and whose we are, is a gift. In theory, we should be good at recognizing the gifts given to us. Yet using words to name our gifts isn’t always easy. One of the skills we need to learn is how to name all our gifts out loud. Because it’s a gift that we are here tonight, celebrating 50 years of interfaith partnership and support in the Pascack Valley. It’s a gift that we, together, can choose to love, care, and be with each other – even though there are forces in this world that want to tear us apart. It’s a gift that I, a Christian, was invited to say these words tonight even though the history of antisemitism in a twisted version of my faith has led to incredible horrors against the Jewish people – an evil that we will continue to denounce, fight against, and do whatever we can to remove. And finally, it’s a gift that every one of you is here and that we, together, will use our words to affirm our collective call to welcome, love, and stand with all. Because as faith-filled people living in Bergen County, we are a gift to each other. As we look forward to our next 50 years together, I don’t know what nouns and pronouns will be on the other side of our future gratitude prepositions. But I believe that our love for each other will grow as we continue to stand in solidarity with each other. 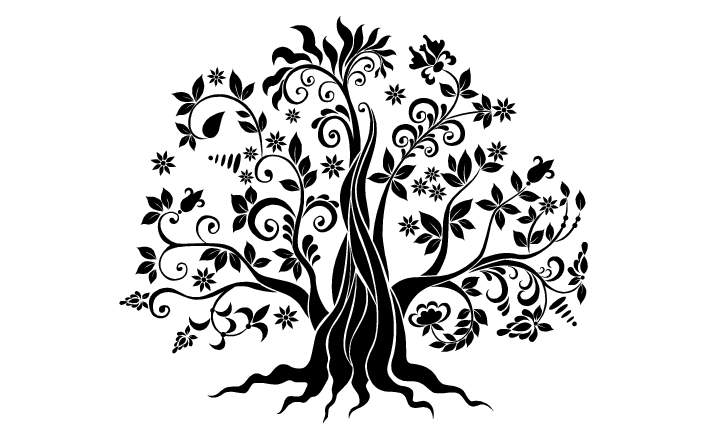 And that we will be a welcoming, diverse, and inclusive community of communities, rooted in our eternal gifts, so that we can be grateful for, grateful to, and grateful with. “As for yourselves, beware; for they will hand you over to councils; and you will be beaten in synagogues; and you will stand before governors and kings because of me, as a testimony to them. And the good news must first be proclaimed to all nations. When they bring you to trial and hand you over, do not worry beforehand about what you are to say; but say whatever is given you at that time, for it is not you who speak, but the Holy Spirit. Brother will betray brother to death, and a father his child, and children will rise against parents and have them put to death;and you will be hated by all because of my name. But the one who endures to the end will be saved. My sermon from the 26th Sunday After Pentecost (November 18, 2018) on Mark 13:1-13. Listen to the recording at the bottom of the page or read my manuscript below. That line speaks about something that we all know but that we don’t, necessarily, practice. We want those with power to serve the greater good. We want people to recognize the power they do have and how they are called to confront the evil in the world. “With great power comes great responsibility” is an amazing line. Except…that’s not the exact quote of what the comic book actually says. 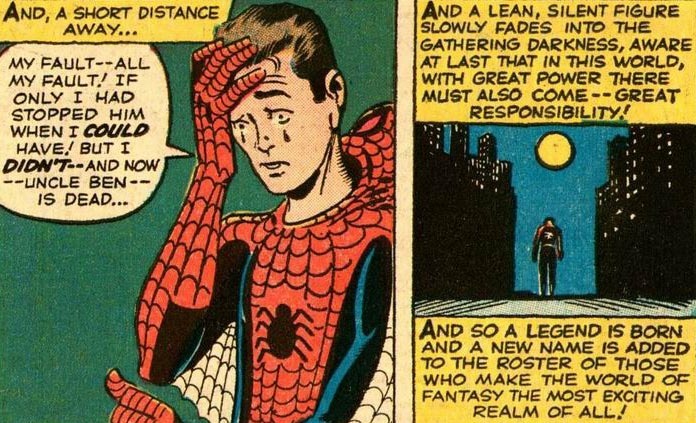 If you opened up your copy of Amazing Fantasy #15 to the very last part of the story, you’d read: “And a lean, silent figure slowly fades into the gathering darkness, aware at last that in this world, with great power there must also come – great responsibility!” We usually leave out the “must also” part of that quotation. But maybe we shouldn’t. Because those words illuminate the inevitable calling that Peter Parker has. He doesn’t get to choose what his responsibilities are. Instead, he gets to live them out and endure. And like all of Jesus’ disciples, he sometimes wonders if this kind of life is actually worth it. At the start of today’s reading from the gospel according to Mark, the disciples were just overwhelmed by it all. They were hanging out in the place God promised to be, in the Temple in Jerusalem, and they were following God’s Messiah. The disciples, I imagine, were filled with a sense of awe as they walked on holy ground with the One who could feed thousands of people with a couple of loaves and some fish. It’s not only the stones and the buildings that were large – the disciples knew that they were in God’s city with the One who could change the world. And in their exuberance, an unnamed disciple, gave voice to that feeling – and Jesus, in response, cut that exuberance short. Instead of basking in the glory of that moment, Jesus shared that everything around them would come tumbling down. Jesus claimed that God’s House, God’s home on earth, would be destroyed. And so, later on, four of Jesus’ friends came to him, wanting to know exactly what he was talking about. If the Temple was going to fall, they wanted to know when. Now that’s a completely reasonable question but what’s striking about that question is who asked it. And to understand that, we need to open our Bibles to the very first chapter of Mark. Because Peter, James, John, and Andrew weren’t just some random followers of Jesus; they were his very first ones. According to Mark, after Jesus’ temptation in the desert and John the Baptist’s arrest – Jesus began his journey to Jerusalem by first going to the the Sea of Galilee. He found two sets of brothers working there. Peter and Andrew were fishing while James and John were mending their nets. Both sets of brothers, at Jesus’ call, left their homes and their families to follow him. And for approximately three years, they saw Jesus work wonders. They watched as he casted out demons. They were there when he healed people that the rest of us tossed aside. Jesus matched wits with the religious leaders of his day and he gave his disciples, including those two sets of brothers, a taste of what it’s like to have Jesus’ power. They, like almost everyone else, imagined that Jesus’ spiritual power would also become a political power that would drive the occupying Roman Empire into the sea. The Temple wasn’t supposed to be destroyed. Instead, it was supposed to become invincible. So the four, the ones who had been there since the beginning of Jesus’ ministry, asked him a question. They wanted to know if everything would still turn out the way they thought it should. They sought assurances from Jesus that, after giving up everything to follow him, he was actually worth it. Because without the Temple, without some political power, and without some honest-to-goodness benefits in the here and now, the two sets of brothers wanted to know if their lives, had any meaning at all. Jesus sidestepped their question. And instead, he told them to endure. He told them to just live. And living can be hard. There are joys, of course, but there’s also struggles and suffering. As we age, we discover that our bodies don’t always do what they used to and our new normal isn’t very fun. Our relationships with the people around us can bring us incredible joy but they can also break our heart. We find ourselves praying prayers that we know won’t be answered. And we watch as entire towns are wiped out by wildfires, hurricanes, and wars. We wonder if being here makes sense because the benefits of our faith don’t seem to materialize in the ways we thought they would. We, in a sense, lose that everyday meaning that should move us into a more vibrant, and easier, future. And instead we discover that there’s a lot of life that we just have to live through. And Jesus, well, he knows that. He not only understands our life but he chose to live that life too. He had the power to do exactly what Peter, James, John, and Andrew wanted. But he also knew that our cycle of living, of violence and war and hurt, was a cycle that needed to be broken. Living for power, for comfort, and for control at the expense of those around us, wasn’t the life God meant for us. So God came down to live with us, to experience first hand what our endurance requires. And Jesus showed us how we can still live even when the stones that serve as the foundation of our lives come tumbling down. Through Jesus’ life and the Cross, through our baptism, through the faith that brings us into Christ’s church week after week, we have been given a lifeline to the divine. It’s here where we receive the creator of the universe: it’s here where we received Jesus himself. And He says that you, as you are, are worth being loved and held by God. Living with faith isn’t easy because faith requires us to be honest about ourselves and our lives. Yet that honesty, in a way, becomes our great power because it helps us admit our collective responsibilities. Whether you are in happiest part of your life or whether everything is crumbling around you, you are eternally loved. And that love is our collective calling to care and serve each other just like Christ cares and serves you. So whether we’re a 95 year old creative legend or a 16 year old kid who was bitten by a radioactive spider, our calling is that we must love, pray, cry, laugh, scream, doubt, and live through our futures, trusting that the peace, mercy, hope, and joy that God has promised to us will, in the end, carry us through. My sermon from the 25th Sunday After Pentecost (November 11, 2018) on Mark 12:38-44. Listen to the recording at the bottom of the page or read my manuscript below. One of the fascinating things about World War 1 is that it’s a war we can see – but one we can’t hear. Even though the war was fought after the invention of the film camera, the videos we have are silent. At the time, sound recordings were mechanically produced by a needle making an etching on wax or metal. The machines that could record sound were simply too big and too delicate to bring into a war zone. Unlike today, where the phone in our pocket can share live images and sounds of wars happening all over the world, the war described as the one to end all wars is one we can’t hear. If want to imagine what that war sounded like, we have to rely on our imagination to fill in the details. A veteran could fill in these auditory gaps, using their own experience in combat or in training as a guide. But the rest of us, well, we have to rely on movies, tv shows, and video games to give us a hint of what war might sound like. 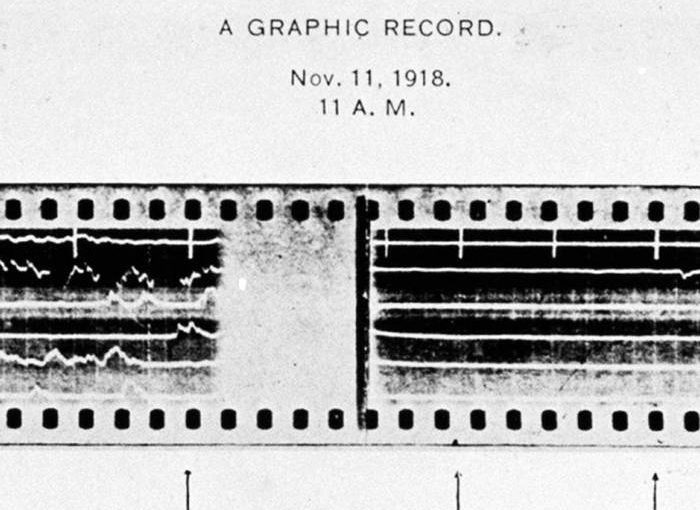 However, in honor of today being the 100th anniversary of the signing of the armistice that ended World War 1, the Imperial War Museum in London found a “recording” of what the last 2 minutes of the war sounded like. Now, it’s not a recording as we understand them to be. It’s more of a series of lines on a chart similar to what we see on a seismometer as it records an earthquake. During World War 1, special military units used microphones and other equipment to find out where enemy artillery fire was coming from. Scouts would watch for the flash from the muzzle of big guns as they fired and then turn on a special machine to record on a filmstrip the intensity of the noise those guns caused. And once that noise was recorded, special computations were done to figure out where those big guns were. Most of these kinds of “recordings” were lost after the end of the war. But at least one piece survived. And that filmstrip recorded the last few moments of World War 1 from the vantage point of the Americans located by the River Moselle. A sound company was commissioned to turn these lines into actual sounds. They researched the guns used in the war, measured the noise intensity labeled by each tick on the lines, and even figured out how the ground would reverberated as each gun went boom. They basically reverse-engineered the sound of the end of a war – and in the minute long clip they posted online, you can hear the artillery guns firing up to the very moment the armistice took effect. Then…silence. And for a bit of drama, the sound company added the chirping of birds to its end. The clip is pretty powerful. It’s the only audio recording we have of what the battlefield in World War 1 sounded like. But what makes it so intriguing – is its silence. Now, before a sound company reverse-engineered those lines on the filmstrip, we didn’t know what it sounded like. It was, in essence, silent to us. But once those lines were decoded, reworked, and made to speak – what keeps us returning to this recording over and over again is the silence embedded in it. It’s not the sound of the artillery pieces that make this recording interesting. What gives it an emotional boost is what’s on there once the sound of the big guns stop. And it’s a kind of loud silence that helps us discover exactly who we get to be. Now, there’s some silence in today’s reading from the gospel according to Mark that we don’t always see. And that’s because, even though the reading is short, its words invite us to imagine a very loud and noisy world. Jesus was in Jerusalem, filling his time between Palm Sunday and Good Friday by preaching and teaching in the Temple. The Temple was the heart of the city, full of noise and full of people. They were talking, debating scripture, chanting psalms, and trying to speak up over the hees and haws of the animals waiting to be sacrificed. I’m sure there were moments when the crowd, while participating in religious rituals, were silent – but the sounds of the city would then move in. Jesus, at first, added to the noise by speaking about the flashy kind of scribe who’s style and rich living amped up the volume of whatever space they entered. But then Jesus switched things up. He grew silent. He walked into the outer court, the part of the Temple women could go into, and he sat down opposite the treasury. He watched as the crowd filed past the Temple’s version of a church’s offering plate and he heard the clanking of many metal coins as they landed in the treasury. Scripture doesn’t tell us how long Jesus was silent. But I like to imagine that he sat there for quite awhile. And instead of critiquing what each person offered, he waited until a widow came to the treasury to drop her offering into the plate. We don’t know anything about this widow. We don’t know how old she is, where she comes from, or even why she’s there. She, like Jesus, was silent at this moment in the text. And she’s carrying with her two small copper coins worth a penny. That amount of money couldn’t buy her much of anything. Yet it was all she had. And as she dropped those two coins into the offering plate, they barely clanged, making little noise as they landed. But Jesus heard them. And he broke his silence to tell his disciples about the widow whose silent actions made an incredible amount of noise. The disciples, as we’ll see in next week’s reading, were focused on the bigness and the noise of it all. The large stones, the fancy robes, and the clang of the many coins tossed into the offering plate drew their notice and attention. But the widow was silent to them because her offering was so small, it appeared to make no noise at all. Yet once the noises around the widow were removed; once she was no longer a person in the crowd but rather a person Jesus saw: she became exactly who she had always been: a person God knew, a person God loved, and a person God saw. Her worth wasn’t defined by the value of what she could put in the offering plate nor by what kind of fancy clothes or places of honor she received while sitting around a dining room table. She was, and always had been, a beloved child of God. And since she didn’t have much of anything, she could only be exactly who she was: a widow who, while in God’s house, gave to God everything she had. Her silent place in the world was, according to God, full of a divine noise that only Jesus chose to hear. And she, owning basically nothing, was still willing to give her whole being to God. We, through the Spirit’s help, can do the same because Jesus Christ, through the Cross, gave his whole self for each of us. We tend to focus on the big noises all around us. We chase after whatever is bigger, brighter, and flashier – looking for stuff, experiences, and other people to fill out life with sound. Yet as baptized and beloved children of God, we already carry within us a divine sound that connects us to the source of all life, hope, and love. We are filled by a divine silence that no earthly sound, experience, doubt, fear, or war can ever drive away or overcome. We, because of Christ, get to be exactly who we are: and you, right now and always, are a beloved child of God. My sermon from All Saints’ Sunday (November 4, 2018) on John 11:32-44. Listen to the recording at the bottom of the page or read my manuscript below. There are a few habits I no longer do that I miss. As a kid, my brother and I would wait until the energy in the air was just right and then we’d setup a board game on our bedroom floor, one that would take us days to complete. Later, in college, there was this one spot, next to the bookstore, that overlooked a small creek. Every time I walked past it, I would stop – letting the sound of the flowing water connect me to a God I did not acknowledge but One who was with me all the same. And for a while, I looked forward to turning on my computer each week, visiting the New York Times’ Style Section, and clicking through a new photo gallery showcasing what Bill Cunningham had seen and photographed. 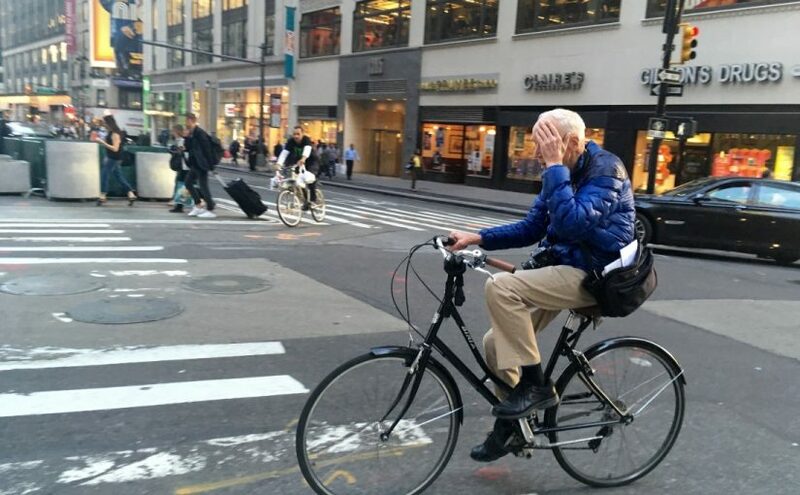 Bill Cunningham was an iconic photographer who you could spot in New York City wearing a bright blue French worker’s jacket and riding a single speed bicycle. A hat designer by trade, Bill knew fashion and he spent decades reporting on what new trends were bubbling up across the world. But what made him unique was the time he spent on the street, trying to find that new and interesting thing that people actually wore. He didn’t spend much time looking at the fancy dresses that an actress might wear on the red carpet for an awards show. Bill was more interested in the shoe or the bag or the silhouette that people wore when they went out. He was, in essence, interested in style – which is not the same as fashion. In Bill Cunningham’s memoir, Hilton Als writes in it’s preface that style is “a certain faith and pride in one’s public persona – ‘the face that I face the world with,’” to quote Tennessee William’s Sweet Bird of Youth. Style is how we showcase “the existential mess and brights spots called [our] ‘I’” – and Bill wanted to discover “what you had made of yourself.” What made his photospreads awesome wasn’t only the creative people he photographed who had a sense of style that I could never copy or dreamup. What you could see in his photographs was his sheer joy at discovering you. Bill was a creative person with an incredible talent yet he spent all his energy looking at and engaging with other people. He could have focused only on himself or used the people around him to create whatever narrative about the world he wanted to tell. Instead, he used his gifts to point forward, to point to the people around him, because the people around us, I think, are needed so that we can live our life in Christ more fully. Today’s reading from the gospel according to John ends in an odd spot. Lazarus, who was dead, is now alive. I think we usually imagine this scene as being one where Lazarus walked out of the tomb under his own power. He was sick, he died, Jesus rose him from the dead, and Lazarus left the tomb in better shape than when he first entered it. But when we pay attention to the text, our vision of this scene changes. His walk couldn’t have included his normal strides with one foot in front of the other because his feet were tied together. The best he could do as he exited the tomb was probably shuffle his feet forward. And that shuffle was accomplished almost blindly because a piece of cloth covered his head. And since we hear nothing about Lazarus trying to untie his feet or remove the covering on his head, I imagine his hands were bound to him, removing all freedom of movement. Lazarus exited the tomb but he was still constrained by the burial wrapping for it. Jesus’ words, like the ones spoken in the opening chapter of the book of Genesis, have this power to rearrange the cosmos and reorder our expectations of life and death. But that same word, in today’s text, couldn’t remove a piece of cloth from Lazarus’s head or make his walk from the tomb a little easier. It’s possible, I suppose, that a completely wrapped up Lazarus is how Jesus wanted people to verify that Lazarus was once really dead and now was really alive. But if that’s true, once Lazarus stepped out of the tomb and everyone could see who he was, that part of the story should have ended. But it doesn’t. Instead, Jesus leaves Lazarus bound and, while looking at the crowd, he tells all of them to get up – to go to Lazarus – and unbind him. It’s as if this act of God’s resurrection isn’t complete unless those gathered around participate in some way. Now it’s hard, at first, to imagine how we can do that. Last I checked, very few of us here have ever raised someone from the dead. But we all, I think, have had moments in our life when the people around us have nourished, sustained, or changed our life into something better. We usually don’t define those moments as equal to Jesus rising from the dead. Our small experience of new life feels tiny and inconsequential in comparison. But I bet the people around Lazarus, when told to go and unbind him, thought what they were doing was small and meaningless too. Yet it’s by Jesus’ invitation that we, in whatever way we can, go and do what Jesus did – and that’s give and generate life. Many of us have been given this life – nourishment, housing, knowledge, experience, guidance, love, forgiveness, mercy, and hope – by a long list of mentors, family members, and friends. They, through Jesus, changed us, informed us, and made us better. Some did so in a very intentional ways; others just by being there in our time of need. I bet many of them never realized just how life-giving they were to us. And many of us never realized how life-giving those people were until years later. We will, in a few moments, light candles in memory of those who gave us life. We will place those candles in the sandbox, letting them burn all the way down, because the life they gave us will never be snuffed out. That life is centered, rooted, and grounded in the One who continually, day in and day out, gives us his life – in baptism, in prayer, at the Lord’s table, and in our faith. Jesus’ invitation to the crowd surrounding Lazarus’ tomb was an invitation for all of us to participate with him in the act of giving life. And we can give this life, make it our habit, because we have, through our baptism, been united with Christ’s own eternal life – a life that doesn’t begin only after we die but one that starts right now. Together we are drawn into God’s act of passing on new life by first bearing witness to the many ways life was given to us and those around us. When we see that life, that love, that hope in our neighbor, in our family member, and in the person sitting in the pew next to us, we discover how we can help unbind each other from the hate, evil, violence, and self-centeredness that this world wants to bind us up with. It’s said that “the light that lit Bill [Cunningham] from within…was that of a person who couldn’t believe his good fortune: he was alive.” You, no matter who you are, no matter your doubts, no matter the ways you feel bounded up – you, through Jesus, are alive. You are a vital part of how Jesus is giving, expressing, and sharing His life with the world. And we are invited to work together, to lean on each other, and to trust each other as God resurrects us, this church, and our world by making Jesus’ life and love a habit for all. My sermon from Reformation Sunday/the 23rd Sunday after Pentecost (October 28, 2018) on Mark 10:32-45. Listen to the recording at the bottom of the page or read my manuscript below. Conscious and conscience are two words I always confuse when writing or speaking. The first one is used when we’re awake, able to respond to our surroundings. A patient in the hospital, when alert and able to respond to our questions, is described as being conscious. Conscience, however, is the word we use to describe the voice or feeling inside us that guides our actions. When we’re counting our calories and then eat an entire plate of cookies – we develop a guilty conscience. These words, conscious and conscience, are different but I’m always mixing them up. In fact, I mixed them up for the title of today’s sermon. Earlier this week, as I pondered the readings for today and the fact that it’s Reformation Sunday, I was drawn to Martin Luther’s use of the word “conscience.” But when I sent the title to Doris, our parish administrator, for inclusion in the bulletin, I unconsciously wrote “conscious.” I didn’t realize it until after the bulletins were printed. But maybe that’s okay. Because, in light of today’s reading from the gospel according to Mark and after yesterday’s brutal violence at a Pittsburgh synagogue, Luther’s understanding of conscience helps us become more conscious to our faith, to our calling, and to the ways we can love the world. Luther, like Bartimaeus, didn’t think his way to Christ. No article or class or study guide provided him the answers to the life he was looking for. Instead, both had an experience of Jesus that changed their world. Bartimaeus, after meeting Jesus outside the city of Jericho, didn’t go off on his own way. Instead, he couldn’t help but follow Jesus. And Luther, once he realized that Jesus, who claimed him in his baptism, would never let him go – he couldn’t help but share with others the Christ he knew. Mercy, hope, and love was at the heart of their experiences. And those experiences fed their faith. Faith isn’t about saying the right prayer, following the right rituals, donating the right amount of money to the church, or doing everything perfect. Faith is about trusting that Jesus will keep his promises and that the old rules of our life are now broken. We are no longer trying to get our beliefs right so that we can keep God on our side. Instead, we get to live our lives knowing that since we’re with Jesus, our world has changed. Through the gift of faith, the gift of Scripture, the gift of worship, prayer, and the Lord’s own table – we are given the tools we need to see the world in a new way. It’s our conscience, when focused on Christ alone, that lets us raise our consciousness so that we can love the world as much as Christ loves us. We get to imagine a world where religious bigotry is replaced with understanding. We get to imagine a world where no synagogue, Hebrew religious school, or Jewish Community Center has to worry about antisemitic or white supremacy acts directed against it. We get to imagine a world where Christianity’s history of antisemitism and Luther’s own antisemitic writings are rightly condemned, repented of, and tossed out. We get to imagine a world where love wins. And, because of Jesus, we do everything we can to live into that kind of world because, in our baptism, in our faith, and through our conscience, Christ helps us stand firm and his way of hope, justice, and love is something we can do. Listen! The Life of Faith Isn’t About Being an Insider. It’s about listening. My sermon from the 22nd Sunday after Pentecost (October 21, 2018) on Mark 10:32-45. Listen to the recording at the bottom of the page or read my manuscript below. On Friday, I rolled into Bergen Community College wearing my standard Sunday attire – black shirt, white collar, gray slacks, and pointed shoes. I parked my car, got lost, had to get back into my car to find the right parking lot, parked again, and eventually found my way to the Moses Center. I checked in with the two young congressional staffers at the front desk and walked into a large conference room. 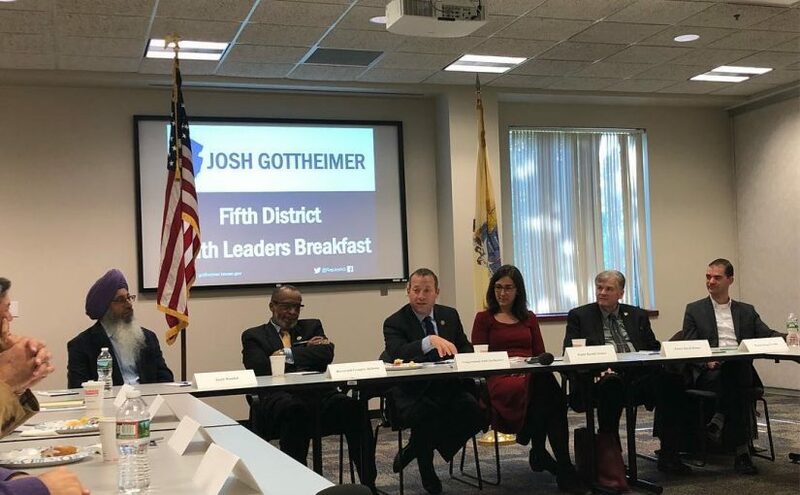 I and a bunch of other clergy from Bergen County were invited to have a conversation with Representative Josh Gottheimer at his 2nd Faith Leaders Breakfast. In that room were clergy and religious leaders from the many different faiths that call the 5th Federal district of New Jersey home. There were rabbis, imans, jathedar (jat-hey-daar), priests, pastors, deacons, heads of benevolence organizations, Sikhs, Jews, Muslims, Christians, Asian-Americans, Arab-Americans, Indian-Americans, Mexican-Americans, White-Americans, African-Americans, immigrants, and native born citizens eating store bought bagels and drinking hot Dunkin Donut coffee while sitting around some large tables. Rep. Gottheimer wanted each of us to share what our communities were currently seeing and experiencing. So that’s what we did. We talked. The issues we covered included refugees, recent hate crimes, immigration, family separation, health care, opioids, the expansion of divisive political rhetoric, and the unaffordability of Bergen county for poor families, recent retirees, and senior citizens. We weren’t there to workshop ideas or find solutions to the problems affecting our communities. Instead, it was a moment to share our story and discover that our different faith communities were experiencing similar issues. We were there to listen and to be listened to. Now, listening is how community is formed. When we see that we are being heard, we learn to trust one another. We need the people around us to accept the totality of what makes us who we are – our good and our bad. And if they can’t accept that, then we build barriers to keep ourselves apart. Those barriers can, sometimes, keep us safe. But when they are misapplied, these self-generated borders diminish the humanity of the people around us. The listening that builds connection and community involves more than just hearing words. It requires reading body language, understanding histories, and discovering that our assumptions and experiences do not always apply to everyone else. We have to admit the ways we’ve failed to listen and we have to undo the walls that stop us from listening to those around us. Listening is one of the hardest skills our lives require. And it’s a skill that the disciples, in the gospel according to Mark, rarely display. It’s probably safe to say that James and John were not really listening to what Jesus had to say today. We are still in the long beginning of Jesus’ climatic journey to the Cross and Jesus has, over and over again, tried to tell his innermost circle the truth about what’s going to happen. He is not, as the disciples hoped, going to initiate a political kingdom that would, through power and violence, establish a new Empire that would rival Rome’s. Jesus’ journey was going to be different. So on 3 separate occasions, Jesus shared that he was going to the Cross. And on those 3 separate occasions, the disciples failed to listen to him. At first, Peter tried to rebuke Jesus but Jesus told him to deny himself and take up his cross. Again, Jesus told them about the Cross but the disciples were too afraid to ask Jesus what he meant. Instead, they argued about which one of them was the greatest. So Jesus pulled them aside, brought the most vulnerable person in his cultural context into their community, and told the disciples to welcome them. And now, after this 3rd statement about what will happen in Jerusalem, James and John decide to interrupt Jesus. They want to be placed on Jesus’ right and on his left when Jesus finally comes into his glory. It’s a bit of an odd request since we know how Jesus’ story turned out. In his moment of glory, two crucified criminals will be on his left and on his right. James and John haven’t really listen to what Jesus has been saying. They saw his miracles, his casting out of demons, and his feeding of pretty much everyone – and these two want to stay close to that. But they articulated their request in a way that actually excluded everyone else. In Jesus’ day, power, prestige, and being the ultimate insider was expressed symbolically by saying what was on your right and left. James and John were not only asking to be close to Jesus but they were, at the same time, filling that space only with themselves. Today’s story doesn’t tell us exactly why they wanted that. James and John do not ask for any special power or secret knowledge or anything that would make them into some-kind of “super” follower of Jesus. But it’s possible that what they wanted was to just be “in.” They wanted Jesus to make them part of the in-crowd – the top two disciples at the popular table in Jesus’ lunchroom. This request was maybe not only about seeking power but more about trying to feel like they truly belong. James and John, after following Jesus all over Galilee and Judea, struggled to understand Jesus’ words because those words seemed centered on separation and loss. Death, we believe, is the way we finally lose each other. And that fear encouraged James and John to do whatever they could to keep Jesus by their side. It’s normal, I think, to worry about losing Jesus. We carry with us certain expectations and assumptions about what a good faith life is supposed to look like. If we believe the right things, handle ourselves in the correct fashion, and make sure to dot our i’s and cross all our t’s – then our faith will always be secure and our spot in “the good life” will be permanently set. This kind of faith is usually not too hard on us, doesn’t really ask much of us, and is supposed to make everything completely manageable. But then real life happens. And we discover that the life we thought our faith secured is a life that doesn’t really exist. We might find ourselves wondering if Jesus left us or we might decide that since nothing is going right, we’re going to leave Jesus. We assume that the Kingdom of God doesn’t actually include us. We stop listening and, in that moment, forget that Jesus is already listening to us. In today’s reading, Jesus used a standard technique to listen: he took James and John’s request, repeated it back to them, and turned it into a question. They hoped to grab onto Jesus by becoming the ultimate insiders but didn’t realize that Jesus already had a hold on them. Every experience you’ve had, every question you’ve asked, every moment when you forgot about God and every time you thought God forgot about you – Jesus did more than just hear you in all those moments; he listened to you. He saw you. And even when you didn’t love yourself, he loved you. Following Jesus isn’t about trying to be the ultimate faith-based insider. Following Jesus is about trusting that he is for you and that he is with you. Our life of faith isn’t supposed to match our expectations. Instead, our faith knows that listening to God is intimately connected to our being able to listen to each other and to our neighbors. Our sense of belonging grows when we step away from the popular table and take a seat at the bigger, more inclusive one, say in a large conference room or at the table set by our Lord. This life of faith, this listening to God and to each other, is how we, together, live into God’s kingdom. And it’s how we finally believe and trust that we are loved.